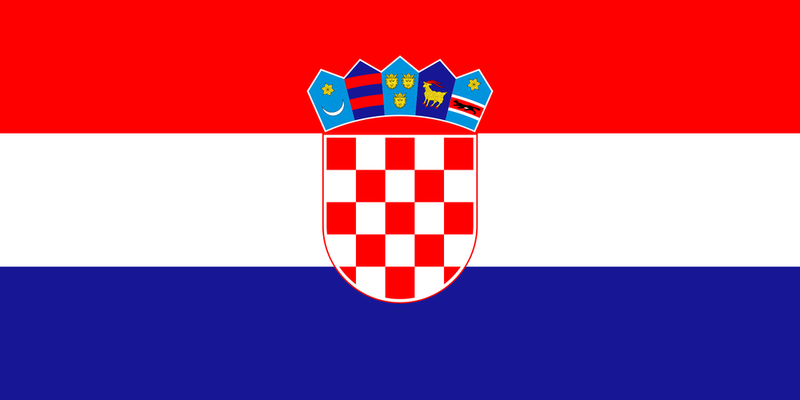 Pan-Slavic red, white and blue stripes behind the Arms of Croatia – a red-and-white checkerboard (a traditional Croatian emblem) topped by shields depicting Croatia’s five historical regions: Croatia proper; Dubrovnik; Dalmatia; Istria; and Slavonia. From the UK, you’re spoilt for choice flying to Croatia. British Airways and easyJet fly daily from Gatwick to Dubrovnik (which is where our Big Trip Croatia itinerary starts), whilst easyJet also flies to Dubrovnik from Belfast, Bristol, Edinburgh, Luton, Manchester and Southend. Other airlines flying to Dubrovnik from the UK include Norwegian (from Gatwick), Jet2 (Belfast, Birmingham, Glasgow, Leeds, Manchester, Newcastle, Nottingham and Stansted), TUI (Gatwick) and Flybe (Southend). easyJet and Wizzair fly daily to Split (which is where our Big Trip ends) from Luton; easyJet runs another daily service from Stansted, and also flies from Belfast, Bristol, Gatwick, Glasgow and Newcastle. Other airlines flying to Split from the UK include British Airways (from Heathrow), Norwegian and Croatia Airlines (both Gatwick), TUI and Thomas Cook (both Gatwick and Manchester), and Jet2, who fly from Birmingham, Edinburgh, Leeds, Nottingham and Stansted. From Ireland, Aer Lingus flies from Dublin to Dubrovnik daily and also to Split. From the US, there are currently no direct flights to Croatia, so you’ll need to fly to Dubrovnik or Split via another European city. The most convenient route from New York is with Aer Lingus (via Dublin), though using a combination of airlines and picking a budget-airline hub is the best way of getting the cheapest fares – for example, flying from New York to Gatwick with Norwegian, say, and then on to Dubrovnik with easyJet. From Canada, the handiest one-stop flight from Toronto is with Aer Lingus (via Dublin), the cheapest is with Condor (via Frankfurt), although this route generally involves a longer connecting time in Frankfurt. As with flying from the US, the cheaper alternative is to fly on a couple of different airlines, such as flying from Toronto to Manchester with Air Canada and then on to Dubrovnik with easyJet, or from Vancouver to Gatwick with West Jet and then on to Dubrovnik with easyJet. You can search for the most convenient routes and the best fares at skyscanner. Dubrovnik Airport (DBV) is 20km south of the city and served by Atlas Shuttle Buses, who make regular runs to Pile Gate, the western entrance to Dubrovnik’s city walls [40kn | 30 minutes], and taxis, who (should) charge a set 250/270kn to either Pile Gate or North Gate; Split Airport (SPU) is near Trogir, 25km west of Split. Flight times to Dubrovnik are just 2 hours 40 minutes from London, and from around 12hr 45min from New York and around 12 hours 15 minutes from Toronto. For stays of up to 90 days (in any 180-day period), British, Irish, US and Canada passport holders do not require a visa to visit Croatia. If you’re a citizen of one of these countries, your passport needs to be valid for at least three months after the date of departure. Entry requirements do change, however, so check the latest with Croatia’s Ministry of Foreign and European Affairs. Croatia is a very safe country to visit, though you should still make sure you take out sufficient travel insurance for your trip. Remember to check with your GP at least six weeks before you travel, although aside from than the inoculations that are part of the routine childhood immunisation programme in the UK (ie diphtheria, tetanus, polio), no immunisations are required. Public healthcare is good and tap water is safe to drink throughout the country, but if you’re from the UK or Ireland, make sure you all carry a European Health Insurance Card (EHIC), which will entitle you to reduced, or even free, medical treatment. One thing to be careful of in Croatia are sea urchins, which are common on the southern Dalmatian coast and around the islands – watch your step when entering and leaving the sea, particularly in rocky areas. Sandals or jelly shoes are a good idea, as are aqua shoes, which you can sometimes buy at Croatian beaches where urchins are present. The most convenient way of travelling around Croatia with a family is to hire a car; Nova Rent a Car have offices in downtown Dubrovnik (a 10-minute taxi ride from the Old Town) and at Split Airport and allow one-way rentals (€50 extra). The E65 motorway from Split to Skradin (for Krka National Park) is a very fast toll road, but until it extends all the way south, you’ll need to take the scenic but single lane D8 for the drive from Dubrovnik to Drvenik; the speed limit is 110kph on main roads, 130kph on the motorway. You’ll need Green Card insurance (available from car-rental agencies for €50) to cover the coastal section of Bosnia and Herzegovina that you need to pass through on the drive from Dubrovnik to Drvenik, or if you’re adding a day on to your itinerary with a visit to Mostar. There’s parking in Split near the ferry terminal at the Zeljeznička Stanica parking lot (10kn for 1 hour, 170kn for 24 hours) and at the cheaper but slightly further afield (it’s a 20-minute walk north of Diocletian’s Palace) Acorus Garage (€15 for 24 hours). Buses connect Dubrovnik with Drvenik (Gradac) and Split, but you would still need a car to get around Hvar. Travelling from mainland Croatia to the islands involves taking one of the ferries that sail regularly from Dubrovnik, Drvenik and Split. Jadrolinija operates the car ferries that run from Drvenik to Sućuraj on Hvar island and from Stari Grad on Hvar to Split. You can book tickets in advance on their website, though note that this gets you tickets that are valid for a certain day rather than a specific crossing; arrive at the ferry terminal well ahead of time (at least 45 minutes before, more in summer) to make sure you get on board the sailing you want to catch. If necessary, you can park your car in the queue and go for a wander or a nearby bite to eat until it’s time to board. Fares are very reasonable – the total fare for a family of 4 travelling in an ordinary saloon in the shoulder season (Jadrolinija’s high-season schedule runs from June to September), for example, is around £15 for the Drvenik–Sućuraj crossing and around £35 for Stari Grad–Split. Dubrovnik and Split themselves are very walkable, with compact old towns, so by far the easiest way of getting around the cities is on foot. You’re unlikely to need to catch a city bus in Dubrovnik, but it’s worth knowing that rides are covered to some extent by a Dubrovnik Card. CROMAC The Croatian Mine Action Centre is dedicated to clearing the estimated 33,000 landmines and other unexploded ordinances that still remain in the more remote areas that saw fighting during the Homeland War. SOS Children’s Villages Global charity whose Croatian association provides support, education and housing to children from vulnerable backgrounds, in a village near Zagreb in northeast Croatia.